Dry roasting is one of the easiest things to do – doesn’t take long, you get signs that whatever you’re roasting is ready but…. you need to keep an eye on it. Well since it takes just minutes, that shouldn’t be a problem. 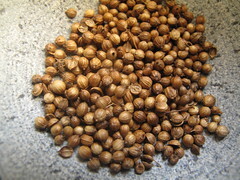 It works well for whole spices like coriander, cumin, cardamom seeds, cloves and the like. 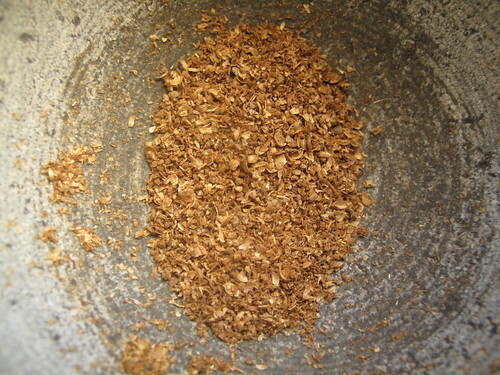 It also works with nuts – whole and flaked – from almonds to hazelnuts, pecans and walnuts. So when I want to make a roasted almond Pesto, I dry fry the almonds in a pan. 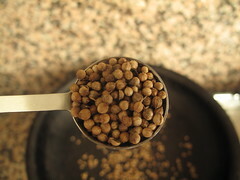 I’ll illustrate the technique with coriander seeds. 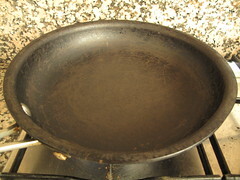 Heat up a frying pan and when it is hot, put in the measured amount to pan roast. Then move the pan around continously so the seeds don’t burn. 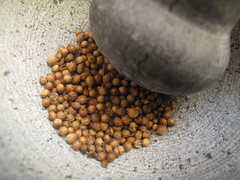 After a minute or two, the seeds should begin to crackle and pop a little bit and you should start smelling the spices. Also the colour should have changed to ‘toast brown’ (new colour in the spectrum 🙂 ). Even if you don’t hear any snap, crackle and pop, the coriander fragrance should be light and floaty. When this happens, turn off the heat and haul the seeds out of the pan – into a mortar if you plan on crushing them or unto a plate. If you leave them in the pan, they’ll continue cooking if they aren’t tossed about. Anyhow, if crushing…. 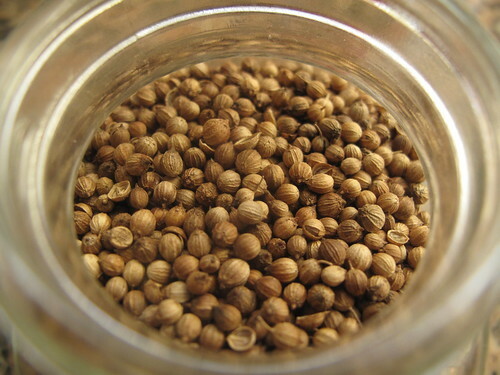 you will be rewarded with the delicious, heady fragrance of Coriander seeds (in this case). Use as desired.